Here at Taylors Petfoods Natural Pet Store we feel very privileged to be a Gentle stockist. 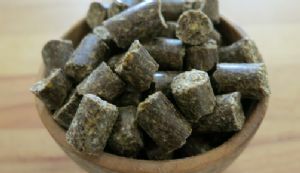 We are very fussy about what we feed our dogs and they are all fed a raw diet. Finding a dry food that we would happily feed our dogs is no easy task but Gentle ticks the boxes. We now feed Gentle alongside thier raw diet. Its such an honest food that goes through very little processing compared to extruded kibble. 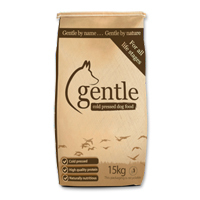 Gentle Dog Food is only available in store. This is to ensure the quality of the product is maintained. The concept behind Gentle is simple. All their foods have high meat content which is essential for your dog’s good health. First, they take some great quality ingredients and gently mix them together. Then add cold pressed oils, herbs, vegetables and other lovely healthy stuff. Next, and this is a really important bit, the ingredients are pressed together for less than a second at a very low temperature. The result? A nugget full of gentle goodness that’s ready to eat. Perfect! Using only very low temperatures allows them to create a complete, balanced dog food that’s as close to nature as possible. In the wild, puppies, adults and older dogs all eat the same natural food - they just need different amounts. And the unique Gentle approach is suitable for all breeds and life stages. Whether you have a gentle giant or a gentle soul, Gentle has everything they need for a healthy, happy, active life. It’s easily digestible and free from any synthetic substances, preservatives or artificial appetizers.